If you haven't noticed recently, businesses in Perth have been taking turns making massive sales in 24 hours with the help of social media and one day deal websites such as Spreets, Scoopon, Zoupon and JumpOnIt. 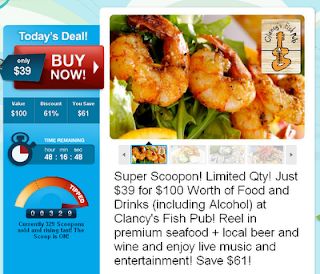 Today I watched Clancy's fish pub make 300 sales in 2 hours by selling $100 vouchers for only $39. That works out to be just under $12,000 worth of sales even if it is at a 60% discount. I am just amazed how many of these websites there are but the idea is excellent. Businesses offer vouchers but require a number of customers to sign up before the deal gets "activated". In this case, Clancy's were really just hoping for 10 people to activate the deal which took less than 10 minutes to achieve. 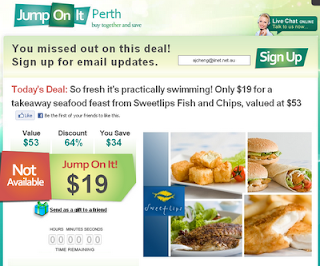 Another deal that was recently mentioned from JumpOnIt sold $53 Sweetlips packs for only $19. That deal reached the maximum 1,000 vouchers being offered, which amounts to $53,000 revenue generated in just under two days! If you don't want to miss out, sign up for these website mail outs. Today's JumpOnIt is a $19 voucher for two burgers, chips and drinks @ V Burger Bar. Share your favourite bargains in the comments below.